What’s this got to do with SEO or search? Since the introduction of Search plus your world and Google plus, the standard ten web results we are used to seeing has changed. Two search results can vary a lot due to the effects of personalisation. Whether you agree or disagree with filter bubbles, as marketers we need to be aware of how we can use them to our advantage - for Distilled, how we can use them to get our clients to the top of the search results when customers need them most. I know I know, Google plus is a ghost town etc but, for some industries, Google plus is worth engaging in and, in my opinion, this will slowly spread to more industries. That's not to say our friends are suddenly going to leave Facebook and jump on G+ but because Google will start at the top of the tree and work their way down to promote awareness and engagement. Take Lady Gaga for example, while I don’t care much for her music it can’t be argued that she’s one of the biggest pop stars in the world. If Lady Gaga decides to exclusively launch her next video on Google plus as she did with YouTube in 2010, you can be sure her millions of fans will do whatever it takes to see that video. Google has already had huge stars take part in G+ hangouts - Daniel Radcliffe, David Beckham, Barack Obama and even the muppets to name but a few. I think we’ll also start to see brands pushing G+ as well, not just online but also on their offline ads and TV campaigns in the way we’ve come to expect brands to push their Facebook pages. Why? Because no matter how many times Coca Cola or whoever ask us to like them on Facebook, it doesn't change the search results - G+ does. 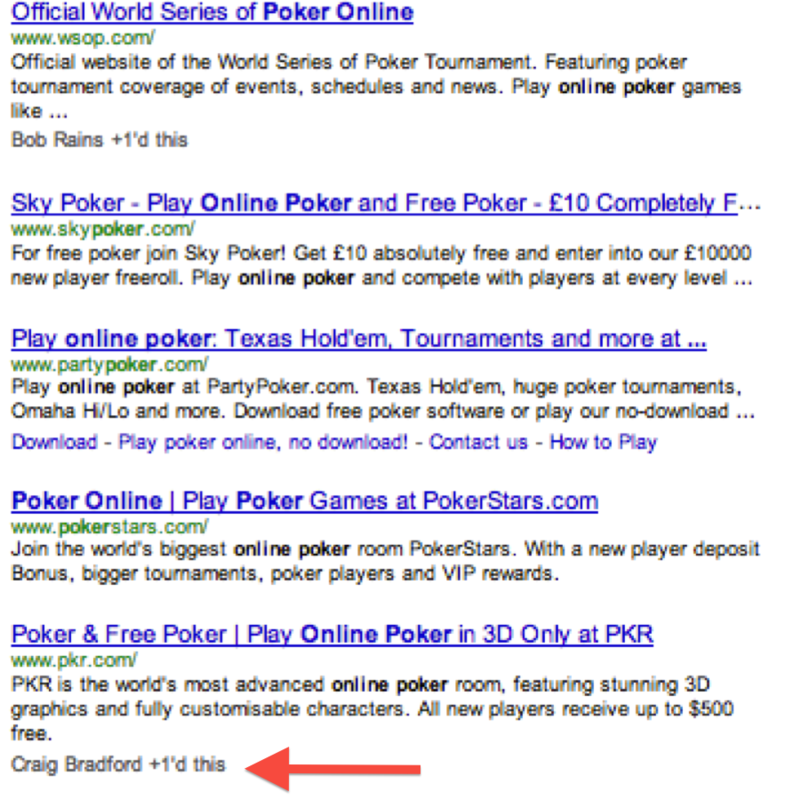 Look at the image below - specifically the grey text beneath the search result - these are the search results for “online poker”. This is the first page of search results when I’m signed into my Distilled G+ account (I have 2, one for Distilled and one for personal stuff). When doing some tests for a presentation in October, I +1’d the PKR site from my personal one. What happened is shown in the image above - because I’m friends with myself (obviously) PKR went from page 2 to page 1 instantly. That’s a pretty significant jump. Let’s think about that for a second, because someone I know +’d a page, Google show it in my search results. Another scenario is shown in the image below. OK, let’s review what’s happened so far as it’s getting confusing. If one of my friends +1’s a page, that page is more likely to show up in my personalised results. If I +1 a page, that page is more likely to show up in my search results. 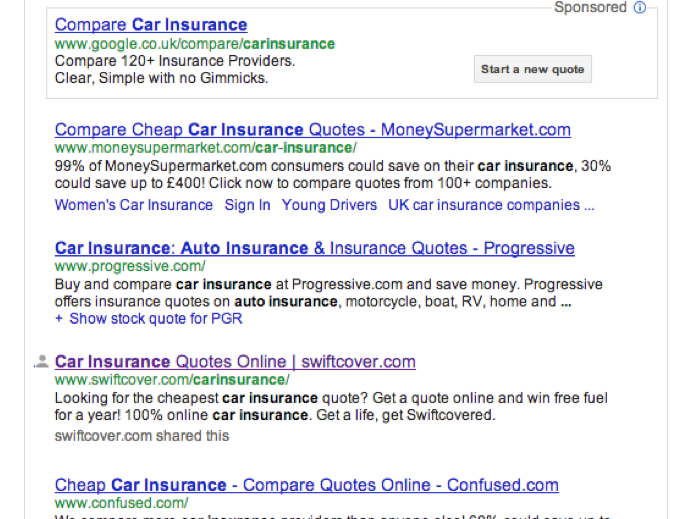 If I +1 a brands G+page, anything that brand shares on G+is more likely to show up in my search results - including their own product pages such as this car insurance example. 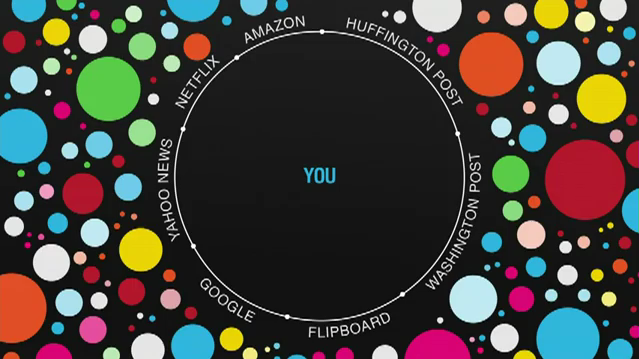 The effects of the above are what I refer to when I talk about building filter bubbles not links. Using the above knowledge, you can help influence the filter bubbles of your customers so that you not only get through that filter bubble but get your clients to the top of the search results when customers are looking for their services. Taking the above into account, assuming budget wasn’t an issue, I have three actions. Celebrity endorsements - Let’s look at point 1 above again - “If one of my friends +1’s a page, that page is more likely to show up in my personalised results.” - Celebrities have lots of friends as I write this David Beckham has 4 million followers, Lady Gaga has 4.8 million followers and Britney Spears has 5.2 million. Celebrity endorsements are not new, all I’m saying is that next time brands like Pepsi and Nike want to pay celebrities like Britney Spears and Tiger Woods $50 million, they might ask them to +1 their page and share their product pages. If Britney Spears +1s your page, she’s potentially just changed the search results of 5 million people. Use this as a chance to overlap search and social. As well as running Twitter and Pinterest competitions are great what about running a “+1 to get 1” competition? Once a month you give away an iPad or similar prize to one of your G+ followers. 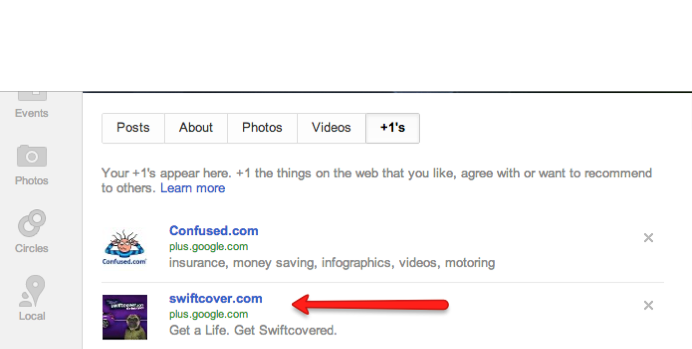 Now anything you share is more likely to show up in their search results. I can’t explain how amazing this is - get people to +1 your page to win an iPad then occasionally share your product pages which show up when they search for things related to that term - it’s a no brainer for me. Don’t feel the need to go direct to customers, if you can get people that are friends or people that are respected by your target market to +1 your brand that will also put you within touching distance of your customers since what they +1 affects their friends search results. Before I finish I’d like to answer some of the objections I expect from this post. Do I think it’s fair that sites jump onto page one just because a friend likes a brand? No, obviously this isn’t true in all cases but, at the moment, Google are clearly still experimenting and like all things in search there can be advantages to early adoption. I’m not saying this is good or bad, I’m just saying we should use it to our advantage while we can. But there’s no-one on G+ - Yes and no. In any case, get over it. We have a habit of thinking unless sites have the audience of Facebook they’re not work engaging in, we need to get rid of that attitude. 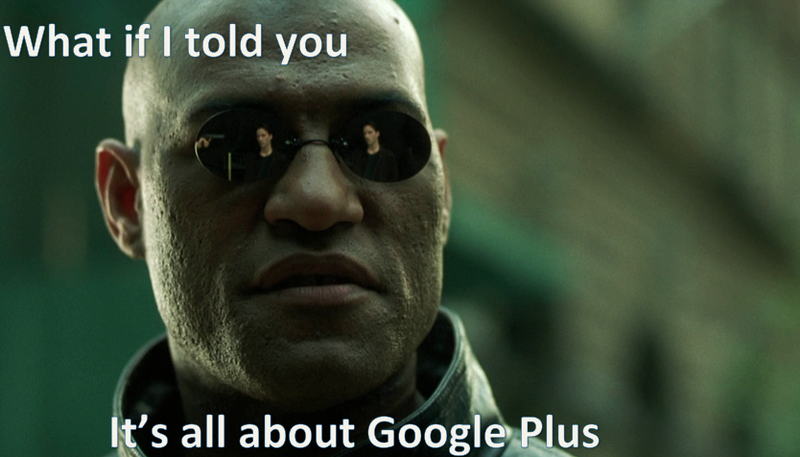 Bottom line is there are millions of users on G+. That’s more than enough to care about it. Am I a G+ fanboy? Nope, I’m just throwing some ideas out there that will hopefully get some interesting conversations going. Ultimately, Google want to be as smart as you and to do that they need to know who you are, what you like and who your friends are - so personalised search is definitely the future - in my opinion, it’s important that we start thinking about these things now. I’d love to know your thoughts so please comment and share.